I walked in to CrossFit St. Paul in March of 2013 in pursuit of getting stronger. Physically, it was just what I needed, but I also enjoyed the mental challenge, goal setting, and socializing that accompanied it. I love that there are always new skills to develop and opportunities to progress existing skills! I CrossFit because…the variability of it keeps it fun and exciting! 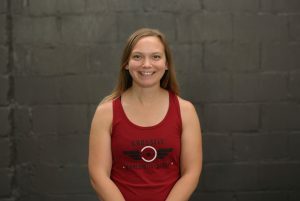 I coach CrossFit Kids because… I love the challenge of incorporating functional movements into activities that will keep kids engaged and excited about fitness.